Hardscrabble has been one of our most interesting owls, a male that was at least four years old when he was tagged on Cape Vincent, NY, in February 2016. 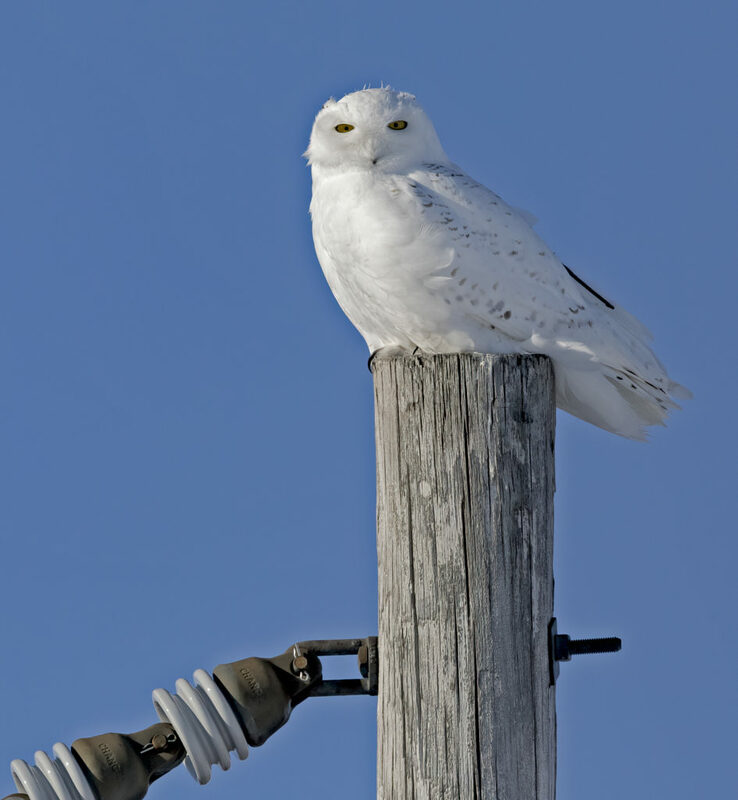 The past three winters he has returned, quite reliably, to the Ottawa River valley near Arnprior, Ontario. But while his transmitter keeps faithfully sending us regular transmissions, a fault in its battery crashes the voltage almost immediately each time, cutting the upload short. This started in January 2018, and as a result, his backlogged data from the previous summer (and everything since) is mostly locked up in his transmitter. Each transmission gives us his location at that moment, so we can keep rough track of him, but we haven’t been able to get the much more detailed data in its memory banks despite efforts to reboot it several times. For that reason, we’ve made multiple attempts over the past year to retrap Hardscrabble and remove his faulty unit, as we did successfully last winter with Baltimore. We’re motivated both by a hope that we can recover all that stored data, but more importantly a desire to free him from what is now an only partially operating device. Hardscrabble’s been a tough nut to crack, though. He’s cagey, having been trapped twice previously, and he’s tended to remain very far from roads or other access points. But last week Hardscrabble was frequently hunting and roosting an area with good road access, so our intrepid Ontario trapping team that caught Baltimore last year — Dave Okines from the Prince Edward Point Bird Observatory, and Patricia and Daniel LaFortune from Ottawa — moved quickly into action. At Cellular Tracking Technologies, Andy McGann reprogrammed Hardscrabble’s transmitter to send us a cluster of transmissions in the final hours of daylight, so the team would know where to look for him. That worked fine, and last Friday, March 15, they headed out on the hunt. That’s also when, after a winter of predictability, Hardscrabble opted to move. By the next day he was well to the southeast of his usual territory, in an area of new housing construction near Goulbourn, ON. On St. Patrick’s Day he’d moved another 50 km (30 miles) southeast, and by March 18 he’d crossed the border to Fort Drum, NY, 65 miles (105 km) farther south. The trapping team was left in the dust. Spring may be working on Hardscrabble, even if the weather hasn’t matched the lengthening days, but most of other owls aren’t moving — yet. This is a time of the year when newly territorial (and aggressive) red-tailed hawks, bald eagles, crows and ravens can become a continual harassment to snowy owls, pushing them out of what had been comfortable winter territories. 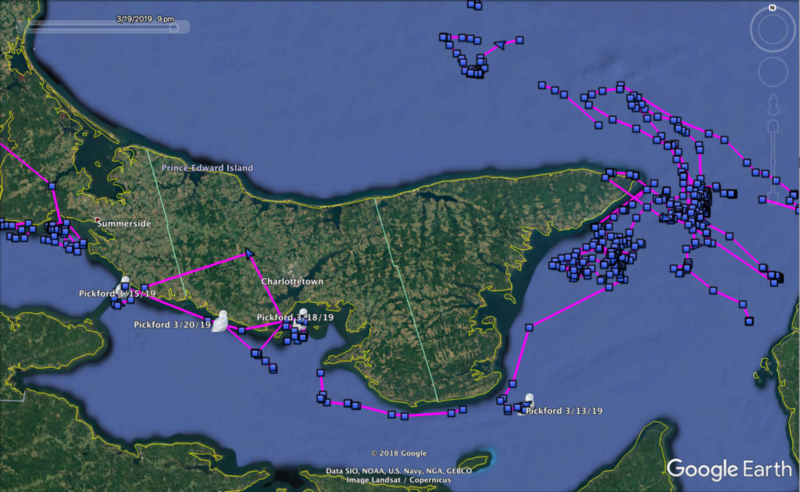 Otter, who had been on Cape Vincent not far from where Hardscrabble fetched up, moved out onto Lake Ontario March 18, looping up to Amherst Island on the Canadian side of the lake, and stopping March 19 on Simcoe Island. Before he left Cape Vincent, photographers Margy Meath and Patty Singer got some great pictures of Otter, which just show the antenna from his hybrid GPS/satellite transmitter. Seneca, the other hybrid-tagged owl, is still settled on his winter territory near Geneva, NY, hunting several large dairy farms along Rt. 5. To the north and east, Island Beach has shifted south a bit along the Richelieu River valley, near the Quebec town of Saint-Jean-sur-Richelieu, while Wells is still working the riverfront in Quebec City, alternating between perching on the street lights along the main highway and the river ice out on the St. Lawrence. Up in the Maritimes, Pickford has now made a complete circumnavigation of Prince Edward Island in the last month and a half. She’s been on and off land recently between Hillsborough Bay and the Confederation Bridge to the mainland. Out in the Midwest, Plainfield has been sticking like a tick to her roughly 4.5 sq. mile (11 sq. km) territory near Coddington, WI. The last transmission we had from Argus was March 14, when he was on the border between Nobles and Murray counties, Minnesota, the same general area he’d been in since early February. Woodworth, on the other hand, has gotten itchy feet again, and moved south across the U.S. border from Manitoba, back into Bottineau County, North Dakota, a few miles southwest of the town of Souris. Finally, up in Saskatchewan Pettibone keeps patrolling his roughly 35 sq. 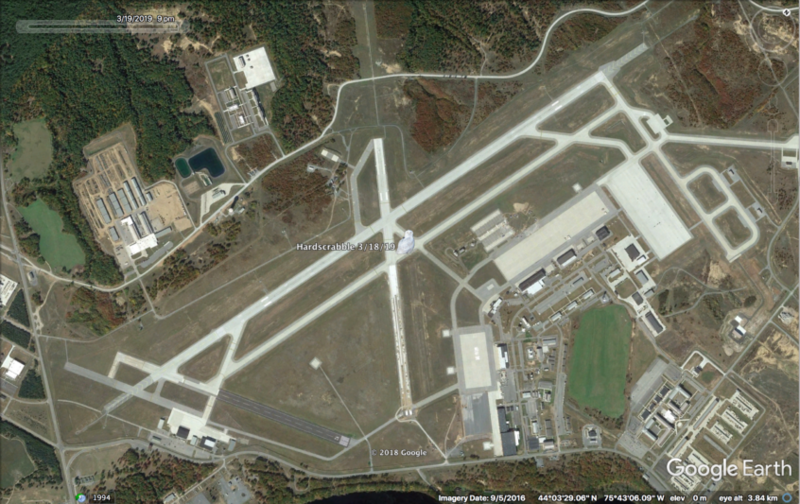 km (13 sq. mile) territory where he’s been since the first of the year. Wonderfully written story of Hardscrabble. His blood is boiling!! What a guy! Looks like it’s gonna be next winter before you get another chance at him. Good luck, Hardscrabble! I do and have enjoyed reading these updates for quite some time. I send them to our one daughter, who “home schools”, and to our grandkids. Thank you and keep up the good work. God Bless. THis is always so interesting, and reminds us that there are so many wonderful creatures in this world. man, i love these descriptions…i feel i am having an adventure with each Snowy and all of you hard workers!!!! Great update as always!! We love to read the adventures of all the snowies. Indeed Hardscrabble seems to be on the move (and did leave us in the dust…). 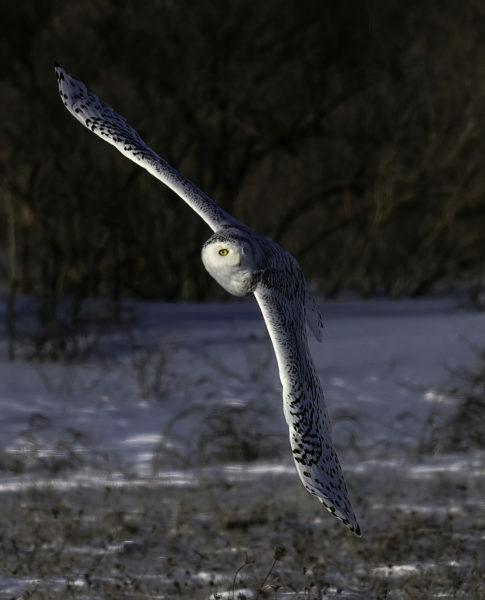 Snowy owls are such wonderful creatures. Great shot of Otter! !